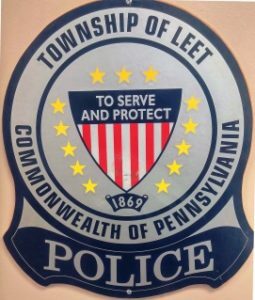 The Leet Township Police Department strives to work in unison with the community to enhance the quality of life for its residents through crime prevention, community partnerships, and excellence in policing. We will accomplish this by maintaining the highest moral and ethical standards. We will treat individuals with compassion, tolerance, and dignity by providing law enforcement services through highly trained and dedicated personnel held accountable to the community. The Leet Township police department is one of the oldest departments in the Quaker Valley area. The department consists of 5 full time officers including a chief and lieutenant. The department also utilizes several part time officers when needed. Providing police services within a smaller community enables our officers to exercise a more personal approach to policing. Our officers are knowledgeable in their job and are continuously updated through training. They are encouraged to interact with the community, thus providing a more proactive and positive relationship. Many of our officers have been with the department for years and are well known in the community. Please take the time to view our individual officer’s profiles for a better understanding.